In the world of social media conversations and that being discussed as THE way of spreading brand stories, here is Coca Cola spreading the ‘Happiness’ story in rural India. 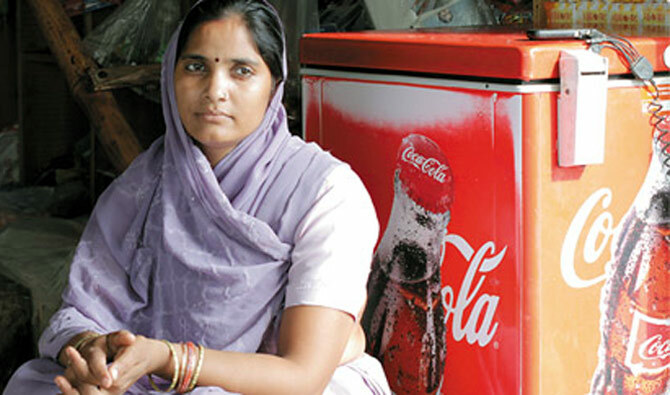 India, Coca Cola 5by20 is focused on building capabilities and providing access to resources to women entrepreneurs through four programs. More than 8,000 women have benefitted from the following new and expanded initiatives. The innovative eKOcool solar cooler program provides income generation opportunities for low-income retailers in rural areas. The 5by20 Solar Cooler program is Cola-Cola India’s environment friendly way to boost beverage sales while economically empowering women at the Bottom of the Pyramid through increased opportunity to generate income. Pragati or “progress” provides business skills training to women retailers also in rural areas. Parivartan or “positive change”, provides business skills training in mobile classrooms that travel throughout rural India. Project Unnati or “advance,” is enabling mango farmers to adopt Ultra High Density Farming (UDHP) techniques, allowing mango farmers to plant more trees in less space, double their crop yield and also their income. Over the next five years, Project Unnati aims to reach out to 50,000 farmers, 15 percent of whom will be women. This entry was posted on March 24, 2014 by thebuystories in customer stories, insights, social storytelling, the power of stories and tagged Coca Cola, Coca Cola 5by20 empowering women in rural India, Coca Cola Happiness 5by20, Coca Cola India, customer experience management, eKOcool solar cooler, Retailer Experience, women entrepreneurs.